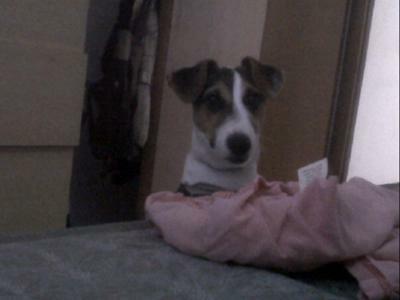 This is my Jack Russell, he is 5 months old, his name is Jack. He is adorable but very active and naughty sometimes. He loves wearing shirts(believe me), playing ball and sleeping. We love him...he is just like a baby to me. Comments for My Jack Russell...."Jack"
How cute! Active and naughty.....sounds just like my Jack Russell "sugar pie"
awwwww same with my dog but hes 4 years old and my moms bed was SOOOOO high for him but now its low so he sleeps on it all the time..